I’m out of the water after my warm-up swim, the water is perfect, and I’m mingling with the other athletes. The swim doesn’t look too bad. They have two large triangle markers in the water about 150 yards out, each about 150 apart. So you swim out, take a right, swim across, take another right, and swim into shore. I’m not really nervous about the swim. I’m thinking about saving my legs for the bike. So that means arm, lots of arms. It’s crazy to be standing on your hometown beach. I never came to the beach as a kid – I was always at the park. But we’re right smack in the middle of downtown Pewaukee. And here I am about to compete in a triathlon. Off to the right they begin the National Anthem. I wish I knew who was singing because it was amazing. As an athlete I’ve always held that moment very sacred: standing at attention, hands behind my back, the start of a great sporting event. A couple hops at the end and we were off to the tunnel. They had all the athletes get organized according to swim cap which was your age group. I was lime green. Kind of hard to gear up for competition wearing lime green. Within a few moments I was at the front of the line, side by side with another guy. You get to the front and they say “Go,” and we’re off. It was a strange start because it’s walk walk walk, swim! I hit my watch and hit the water. Just as planned, I started off smooth and slow to make sure my shoulders were feeling good. I had plenty of space around me. I got into a nice rhythm and then some guy swam up on me so I kicked a little harder, holding my ground. He must have veered and that was the last distraction I had. I got to the first buoy in 3:37 (yes, I looked at my watch). I was a little behind pace, but as I picked it up, I also make that right hand turn and now I’m breathing on my right side and looking right at the sun each time. Kind of embarrassed to say I didn’t see that coming. Not a big deal. I made it to the next buoy by 5:45, so that felt good. But again, a right hand turn meant now as I spot my course when I look straight ahead, I’m looking right into the sun again. This time it was worse because I was really looking for direction. I was forced to swim towards the sound system on shore. I know I wasn’t swimming as straight as I would’ve liked, and I broke stroke more times than I care to admit in an effort to track my route. All that to say I got out of the water in 9:56, almost 2 minutes longer than I thought it would take. Putting those feet down and running to shore was a rush. Googles came off with the swim cap in one pull and we were off to transition. There were lots of stones on the run but I made it to my bike as quick as possible. This was my first checkpoint to gather my thoughts and regroup. I threw my shirt on which was tougher than I expected with my wet body. I sat down and got my socks on making sure no stones stuck to my feet – that would be bad on the bike and the run. My Gu packet was already open so I ate that and slammed some water. I skipped the banana and slipped the shoes on. Helmet and glasses, bike off the rack and I was running to Bike Out. They were yelling for us to not get on until we were passed a line, I crossed, jumped on and I was off. Forty yards later so was my water bottle. I had purchased a new straw and accessories for the aero water bottle attached to the front of the bike. One rubber band must have slipped off and the bottle went flying. I had another bottle on the frame and so I had a decision to make. I knew I’d only drink maybe four times on the bike, so I elected to keep going, hoping it would be there when the race was done (it was). Biking out of town was a lot of fun. I’ve watched a lot of Ironman competitions where the crowd is gathered at the swim, they hit the bike and they’re gone. Turning right onto Prospect my legs felt great but it’s a long slow uphill. I picked out bib #454 in front of me and tried to keep pace with him. Classic mistake – not necessarily in this situation because I held my own, but typically it isn’t a good idea to pace off someone who you have no clue what their fitness level is. He could be biking stronger than me, but in this case I was off to a good start. I certainly passed my share of competitors. I settled into the aerobars felt great. For the first six miles I would pass a couple guys but then one or two guys would just blow past me. It’s kind of a kick in the balls – no other way to say it. Some of these guys can just hammer the bike. And I knew this was going to be the case. Biking is by far my least experienced leg of the race. I simply don’t have bike legs yet. But I will. We got out of Pewaukee and were on Gulf Road parallel to 94. I just wish I knew how to pace myself more on the bike. I certainly was a little more conservative than I needed to be but I wasn’t about to bonk on the run. Reaching the halfway point of the route, the hills begin to get bigger. Nothing was too challenging, but I know my lack of training on hills was pounding me into submission at this point. And again, plenty of biker wet powering past me. Boy, they can hammer! It gives me so much to work on, it was truly very motivational. I had really good perspective and expectations for this race. What goes up must come down, so we had some nice rides upwards to 35mph which were a lot of fun. There were a couple cat and mouse games with some riders, my bike was able to track them down at certain section and vice versa. And then just like that we were turning back onto Wisconsin for the home stretch. Getting off the bike I tried running in my shoes which have the clips and I really didn’t like it. I was very worried I’d slip and twist an ankle so I pulled over and took my shoes off. I’m not sure I’d do that again because it was a project to run with the bike and shoes. Again, the tunnel had plenty of stones and now the volunteers were yelling at us that the ground was wet and slippery also. I made it to my spot, racked the bike, helmet off and shoes on. I threw a Gu into my back pocket and was off. Those first few hundred meters were tough. Slow strides, things don’t seem right for an experience runner like myself. And everything is so slow! I was staying pace with one guy who looked pretty strong, but there were two other guys who looked like I should be blowing them out of the water. Wasn’t happening. Every step, so slow. Again, with more brick training (doing a bike ride followed immediately with a run) I’ll master this transition. The first mile I got my legs under me which started to feel better, but then mile two is a long, slow uphill. It peaks at the top of School Street, the campus of the Pewaukee School District. This was a pretty cool moment running around the streets where I spent 13 years of my childhood education. A lot of it looks different, but I guess I’m pretty different too. Lots of pride in that city, lots of memories. Feels great to be back. After weaving down and back a couple roads up there, I ran past the football field and old practice field. It’s on this campus where I grew to be an athlete; it was fulfilling to return in competition like this. I made one last turn and remembered my first race as a kid, some kind of trail run through school – hardly anyone did it but it was back in the fields at the time; now new building stand where the race was held, but I remembered that race and again appreciated the journey, the memories. No one says a thing on the course. Bike 13 miles, run 3.1 miles… nothing. But I was thankful for one guy who spoke up just in front of my old elementary school. He said “exactly one mile left.” My GPS wasn’t working and I knew about how far we had to go but I didn’t know mileage. My split of the run was 17 minutes, so one mile left meant I had been running 8:45 miles. I thought to myself that I can go a lot fast than this for one mile. So at the bottom of the hill I picked it up. That last mile felt great and I ran it in about 7 minutes. 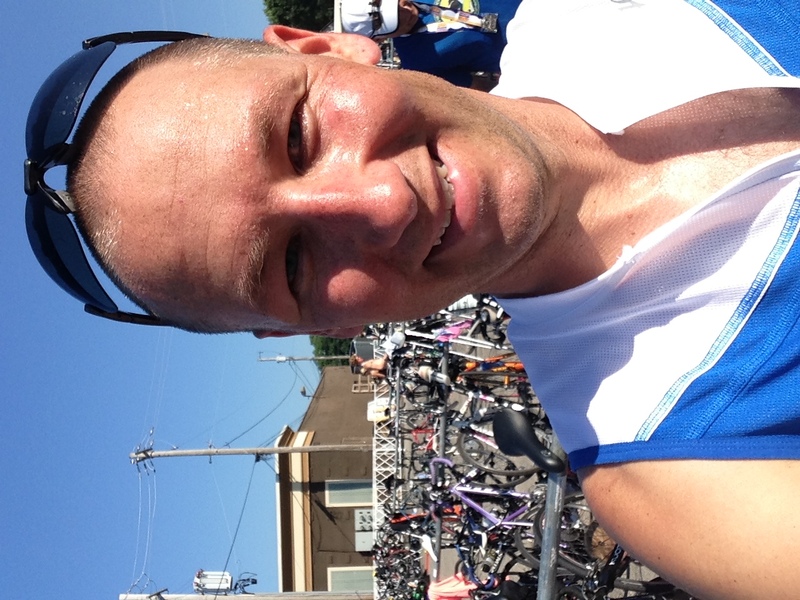 I crossed the finish line of my first triathlon in 1:22:38. The first words in my mind were “Wow, that felt great.” Then I thought “Where’s the chocolate milk.” They had none. And finally, before I took of my ankle timing chip, before a got a medal around my neck, I was thinking “What’s next?” It’s addicting. I’m hooked. It was a fun race and I can’t wait to do it again. It means lots of training, lots of dedication and preparation from workouts to nutrition to balancing training time and family time. But I’m committed. You’ll see me in Pewaukee next year as long as it fits with other races I know I’ll want to do. And I want to get others involved. Honestly triathlon is very doable. I want to put a team together to train for these next year. There’s so much that can be gained by training for something like this. I want others to join me in this pursuit. There you have it. It was a fantastic experience. I trained well, I have a lot of work in front of me. And I have a lot of people to thank. First, we had our third child eight weeks ago. Katie is working so hard with Hans Christian and she’s not getting a lot of sleep. But she pushed me out the door a number of times to get a run or a bike ride in. She challenged me to do a mini-tri in preparation for my first competition. I’m so thankful for her encouragement, coaching, and handling of our house as I train. Also, it should be noted I don’t own a bike. 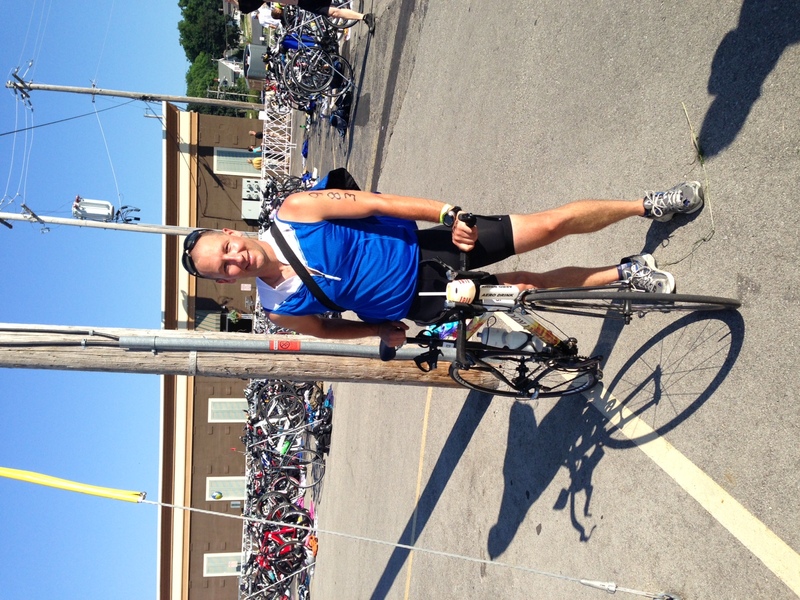 My friend Mark Anderson let me borrow his bike (which he used for Ironman!) and I literally couldn’t have done this without him. I started competitive swimming in March and thanks to Katie at the McFarland high school pool, I’m starting to figure it out. She’s a great coach. My friend Todd has a couple Ironmans under his belt and on our last training run he gave me some pointers and our friendship has started to fuel some ideas for future races. Tim Murphy did the Olympic distance this year, and knowing that I hit him up with some questions before the race since he had done the sprint distance the year before. Deann McIntosh made sure I was at transition early enough and she put me at ease with my transition gear set-up. It’s been fun getting to know her a little more the last few weeks. I didn’t have to pay for a hotel in my hometown thanks to Josh Goodman – it was great catching up with one of my oldest friends. Do you see how this works? It’s a team thing! I’m hooked. What say you? First tri in the books. Many more to come! This entry was posted in exercise, Training on July 19, 2013 by Hans Schiefelbein. Congratulations, Hans. An amazing accomplishment. Awesome to see you train for this and then hear about the race.